Give her look a fresh twist with the Celeste fashion. 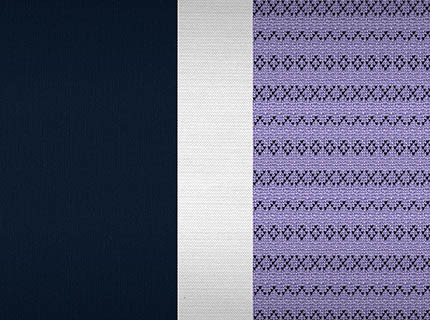 Celeste features a sweet Fair Isle patterned knit in lavender hue paired with rich navy. A matte silver trim completes this delightful ensemble. KidFit 2-in-1 Belt Positioning Booster Car Seat - Celeste is rated 4.5 out of 5 by 21. Rated 5 out of 5 by Sarah Jo from Love but Grr Love the carseat..frustrated the color I want says only available at Target yet Target does not carry it either. Rated 5 out of 5 by crmcgruder from Chicco Does it Again We have owned many booster seats as our kids have gotten older, and this by far is the easiest one we have ever owned. The comfort and ability to adjust for our six year is amazing. Most boosters that we have owned that use the latch would loosen over time which caused us to have to retighten the seat constantly. The cinch tightener makes the seat feel like it will stay in place for a long time, even with the kids getting in and out of the seat. The great thing is that the height is adjusted from the base and not at the top of the seat. Other boosters we have had felt very flimsy when you had to adjust the head rest. It made me as a parent questions the safety of the booster. Here the Chicco unit adjust from the base of the booster keeping the head rest and back section in place. Arm rest and cup holders are always a plus and the fact that it is easy to wash make this a easy choice. Rated 5 out of 5 by Bstyles from Durable Bought this item for our daughter. She loves it. Very easy for her to access the seat belt to unbuckle herself. I'm having a little trouble with keeping the seat belt flat over her shoulder. I don't know if it's the belt itself or how it slides through the slot. Rated 5 out of 5 by Tracy72 from The latch system is my favorite. Changing my very tall almost 5 year old to a booster seat was hard for me. Safety is always my first thought. I did a lot of research before making the change. I love the safety features and my daughter loves the freedom she feels. Rated 5 out of 5 by megsliz17 from Easy to Install, love the adjustable back! Due to the fact that my daughter is growing faster than I can keep up, I love the fact that this booster has a rear head adjustment. I wanted the security of a booster with a back, but was afraid to take the plunge...due to the fact that she might outgrow something that is non-adjustable. Furthermore, the booster was ridiculously easy to assemble and install in my vehicle. After experiencing several other brands of car seats (including boosters), this has definitely been the best investment we've made. What is the max height my child can be to use the highback option? How come I'm not able to get the booster tightly secured with the LATCH system? The pull stops after a certain amount and it won't let me tighten it any more. The seat wiggles around which is causing an issue when our kid gets into it since it tips. What is the actual seat depth? The inside seat depth is approximately 14.5 inches. Are the LATCH connectors necessary for use? I want to install this seat in the center of my back seats, and there are no LATCH connectors there. Please advise. Thank you. If you are using a seating position that does not have latch anchors you do not have to use them. Place the car seat in the vehicle seat, adjust the height of the car seat and the seat belt guide (for the vehicle lap-shoulder belt) accordingly. Are there limits on using the latch system for this seat? Can you use it at all times? There are no limits for using the latch system with the Kidfit booster seat. As long as the child is within the guidelines for height and weight, you may use the latch system with the vehicle lap-shoulder belt. The Kidfit car seat in the Aurora color has been discontinued. I have a child that is well in the weight and height range of this seat, but is only 3 years old. Can she use this seat if she meets that criteria? The Chicco Kidfit Booster Seat may be used for a child at least 4 years of age, between 38-57 inches in height, and between 30-110 lbs. All 3 of these requirements must be meet to use this product. This Booster Seat is designed for children, and who demonstrate an ability to sit in a seat belt. &bull; Child can sit relatively still, in the same seated position throughout the car ride. &bull; Child can leave the shoulder and lap belt properly positioned on their body, and can do this every time in the car. Federal Motor Vehicle Safety Standard 225 requires the vehicle lower anchors to be spaced&nbsp;280mm (11 inches) apart.&nbsp; Our car seats can only be installed in a designated standard Latch seating position in your vehicle.